Mike Falcon was born in Los Angeles, California. After attending the University of Santa Barbara Michael traveled through Europe and South America as a musician experiencing many of the diverse cultural values of the western world. Michael, a completely self taught artist, then moved to New York in 2004. Michael’s earliest work, pop iconic (abstract portraits of rockstars) shows the influence of artists like Basquiat, Andy Warhol, Jackson Pollack, and Natvar Bavsar whom Michael befriended shortly after arriving in New York. In 2005 Michael began experimenting with new mediums and techniques. In 2006 he arrived in his signature style, the printed material made almost abstract by applying multiple layers of collaged strips, embedded with codified messages through word logos, shadow silhouettes, reconstructed cultural icons, and photography. 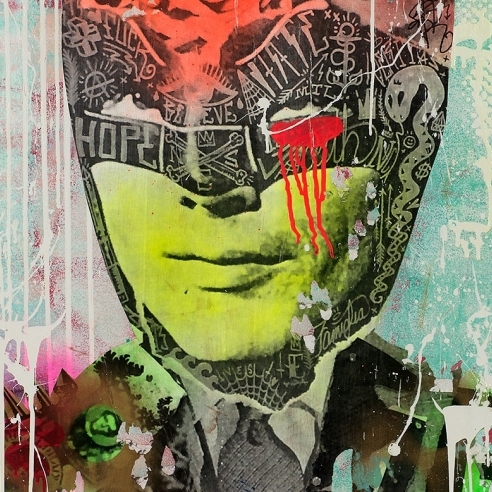 Superheroes, pop figures, and cultural obsessions abound in Falcon’s work, juxtaposed with his ubiquitous word symbols. His passion for the graphical is inspired by his experience at the gritty periphery of the New York cityscape, where paper-plastered advertising walls reveal their histories layer by layer and now three dimensional. His intensely organized chaos combines this gritty aspect of the detailed cityscape with an ironic view of the contemporary American cultural scene. New York’s muted metropolitan landscape shaped Michael’s work fleetingly, while its graphic subject matter left a lasting urban impression of the tracings of New York’s past and present. Michael’s main goal with his new work is to create a positive exertion from each and every painting. Inside, underneath and atop his paintings are hidden and unhidden positive AFFIRMATIONS, along with the harmony and balance of color. Michael’s arrival to New York has brought an increasing recognition of his work along with several commissions for murals as well as winning best in show award at ARTEXPO 2009. These commissions afforded Michael the opportunity to create color environments on a monumental and global scale. He is now achieving financial success and critical acclaim amongst the art world. Michael resides in New York today enjoying his life as a living working artist. Michael’s belief is: “The more we create out of love, the more love there will be”.